In some cases, you might want to reach out to your customer via chat before they have to reach out to you. 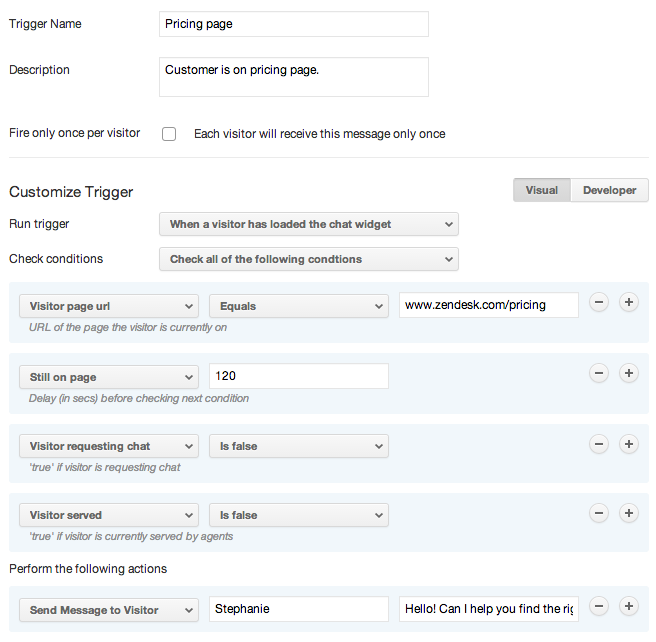 You can set up Zendesk Chat triggers that initiate a proactive chat with a customer based on specified conditions that you define. Your customer can choose whether or not to respond. Note that Basic plans are limited to two proactive chat triggers. Repeat customers and return web visitors are valuable to your business. To help make sure these customers are finding what they need, you can proactively reach out to them via chat to welcome them back and see if there is anything you can provide guidance with. Set the conditions of the trigger where the visitor previous visits is greater than 0, as well as the conditions where the customer has not yet been helped by another agent or initiated a chat already themselves. As a customer, how many times have you added items to your online shopping cart, and then completely abandoned it? 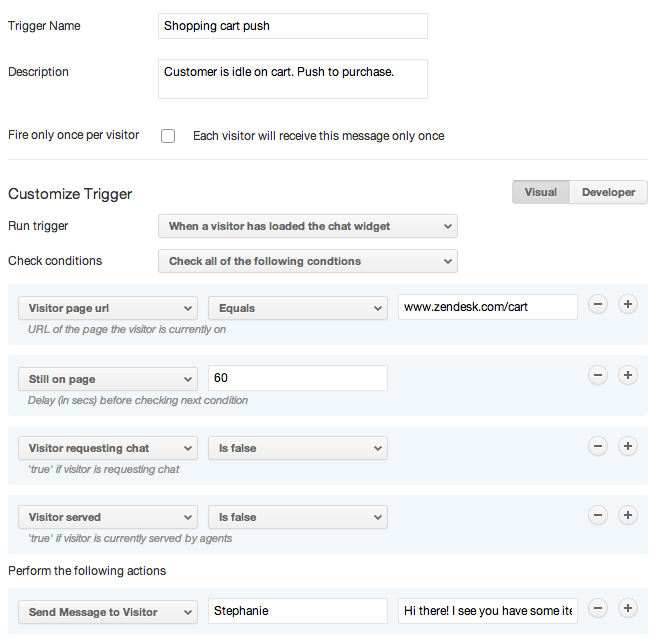 To provide customers that extra push to purchase, you can set up a trigger to initiate a proactive chat when a customer is on your shopping cart page URL for a specific length of time, more than 60 seconds, for example. You can send them a personalized message to see if they have any questions about the items in their cart. Similar to the previous shopping cart example, there may be some critical pages on your website or Help Center that you would want to provide customers with an extra level of support by reaching out to them. One example would be when a prospect is on your pricing page and evaluating which plan or product to select. You can initiate a proactive chat to provide guidance they might need. We have started using these proactive chats quite a bit. However there doesn't appear to be a way where we can prompt the customer to give us their name and email address so they just get known as "Visitor 1499859311" which is not very good when they are your key contacts Any ideas how we can get round this issue. Would the trigger only fire during business hours? The Schedule functionality (that can be used to set up business hours) will not allow agents to set themselves as Online outside of business hours. As a consequence, the widget will not be in the active state and the proactive trigger will not be applied. Can I hyperlink text in the initial chat message? I agree with Jennnifer. Is there a way to capture the customer's name and email if a trigger has been sent? @Annette if you enter a URL, it should automatically get hyperlinked in the widget. @Jose there is no way to present the pre-chat form to collect that information when a trigger fires. One solution customers have done is send two messages in the trigger, the second asking them for their name and email address. Then, the agent can fill the information out for the visitor. @Ramin it would be extremely useful if we could get the pre-chat form to still be required even if a trigger initiates an outbound chat in order to require the user to input their identifying info (name, email address). I view this as a rather important option that you should offer. The chat-initiating triggers are of little use to us otherwise, and we'd really like to use them! This will mean triggers will fire and you will still have the visitor information. It should be fine using Google Tag Manager, you just need to ensure the API is fired on every page change. Is it possible to proactively chat with customers who have previously purchased from our website and then returned to the site again? 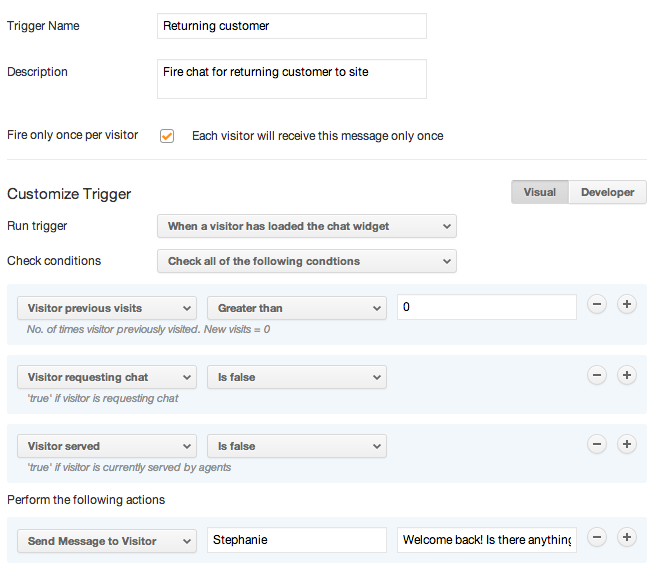 Currently, Chat triggers are not built to support that use case. Zendesk has another product called Connect which is designed better for that type of proactive messaging based on past purchases. Chat SDK does not allow for any action before the customer initiates a chat. In this case, sending a proactive chat to your visitor is not possible through mobile apps.